Susan Clairmont, a columnist who frequently covered crime and the courts for The Spectator, heard the call. The newsroom quickly mobilized. They knew from the call that there was an officer in crisis — nothing more. A photographer was immediately sent to the scene. In the meantime, Clairmont and another crime reporter gathered with senior and city editors to assess the situation and determine their next move. Piece by piece, more information came out. One man had been killed. It was a plainclothes police officer. He had been found inside a police vehicle — an unmarked silver sedan. Police said they would not be investigating the incident. What had happened? From the cemetery, the photographer reported first responders on the scene and police officers who were noticeably upset. The Spectator newsroom quickly decided that it needed more information to determine whether to publish the story. Clairmont took charge of the assignment. Over the course of the day, many people in the newsroom were involved in the debate. Other vocal participants in the conversation were Jim Poling, The Spectator’s assistant managing editor and now managing editor; Roger Gillespie, the managing editor; and Dana Robbins, the newspaper’s editor-in-chief. As reporting got underway, more details of the event began to unfurl. The officer had been on duty at the time of his death. He worked in the Investigative Services Division, and at 45 years old, he was a veteran of the force. The gunshot that ended his life had come from his own service weapon. The newspaper found itself faced with a dilemma: did this instance of suicide warrant newspaper play? Yes, the deceased was an on-duty police officer. But under his uniform this officer was a person — one who had clearly suffered mentally and emotionally. His death was a tragedy for his family, and the force. Some said it was a private matter, case closed. Clairmont and Poling knew they needed to act on this incident, and fast, to meet the publication deadline for the next day’s paper. The question was: What could they report, and how could they do it truthfully and responsibly? 1. 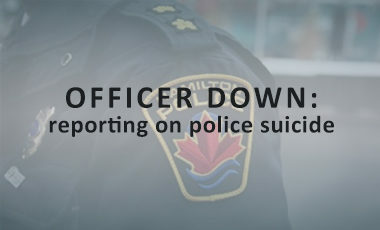 "We don't routinely report on suicides"